It’s hard to believe that Halloween is just a couple of weeks away! Come October, Halloween is all my stepson can talk about. The treats, the costumes, and all the fun spooky foods we will prepare together. With the holiday falling on a weekday this year, you know the kids are all going to be talking about their costumes and candy during lunch that day. 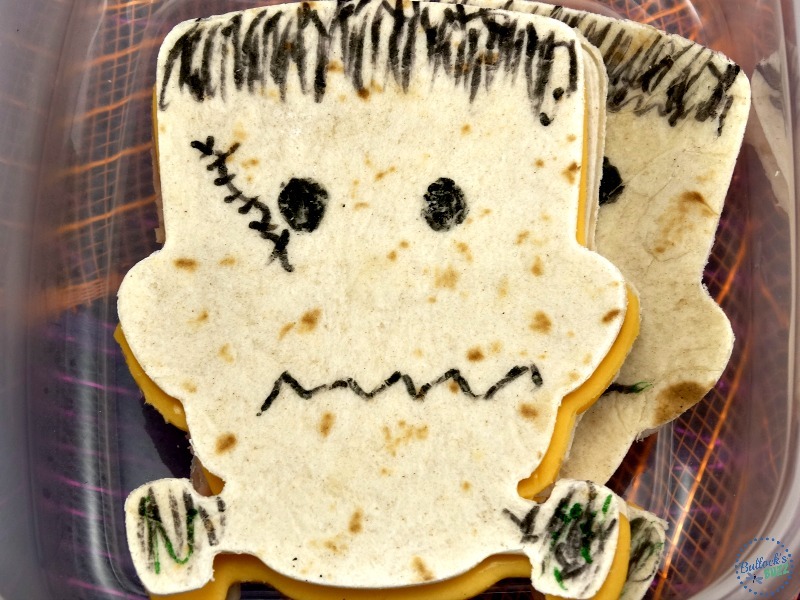 So why not get them into the haunting spirit early with this spook-tacular Frankenstein Halloween lunch box idea. 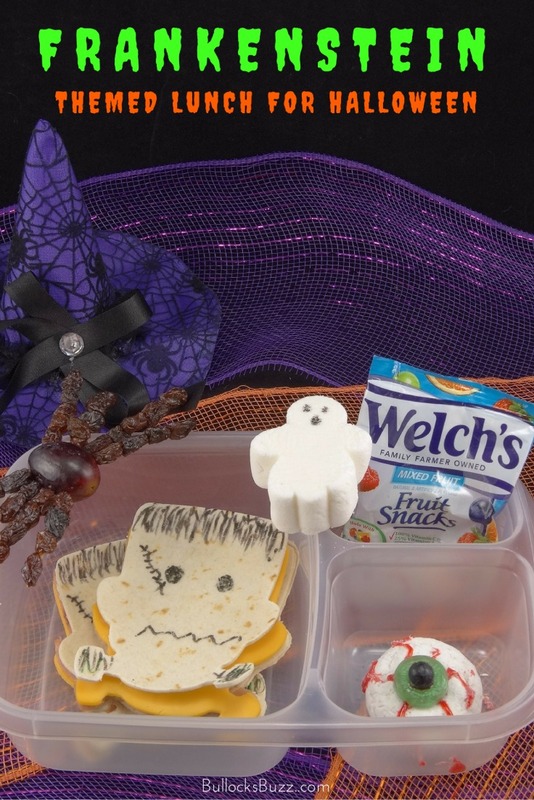 This healthy and fun Halloween lunch box is one your little goblins are sure to gobble up! It takes just minutes to make, and you can even include a cute Halloween printable lunch note! To make this cute lunchbox theme you will need the following ingredients and supplies. Frankenstein shaped cookie cutter (aff. link). Make the Ham and Swiss Frankenstein Sandwiches by using the Frankenstein cookie cutter to cut the tortillas, the ham and the cheese. Cut as many pieces as your prefer. Put the mini sandwiches together using a bit of mayo for extra flavor. Use a black edible food marker to add Frankenstein’s facial features including the eyes, hair, mouth and scar. 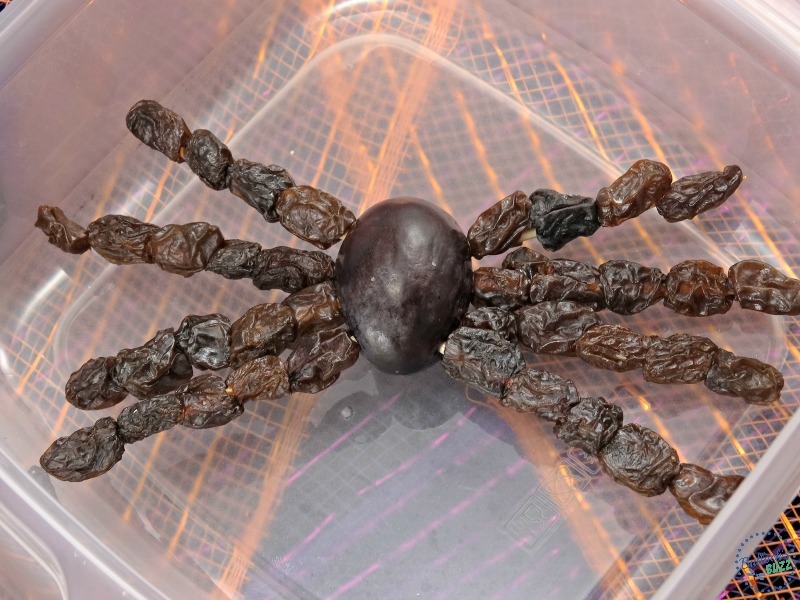 Next, make the fruit spider using a large red grape, toothpicks and raisins. I find it easiest to put the raisins on toothpicks first and then insert the toothpicks into the grape. 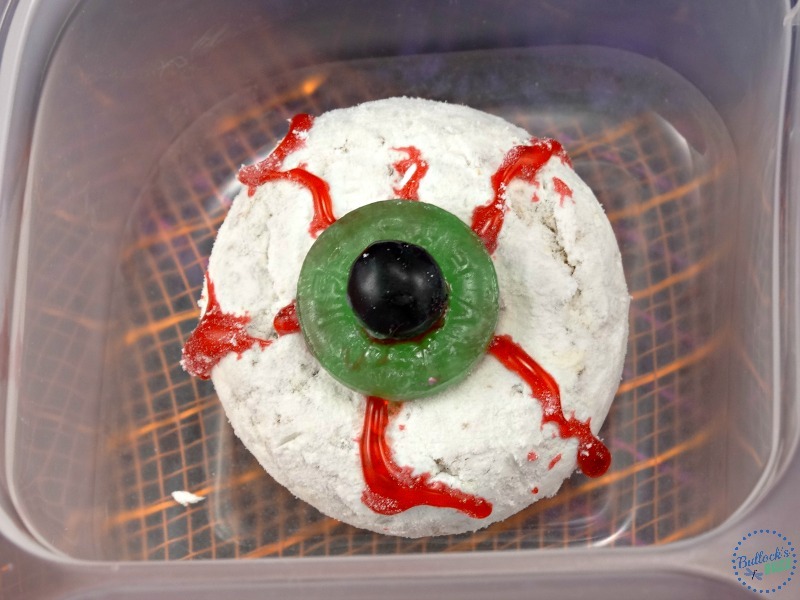 For the donut eyeball, first draw the red lines using the red gel icing. Next, place one Lifesaver candy in the middle of the donut, then attach a black Sixlet using a dab of the gel icing. 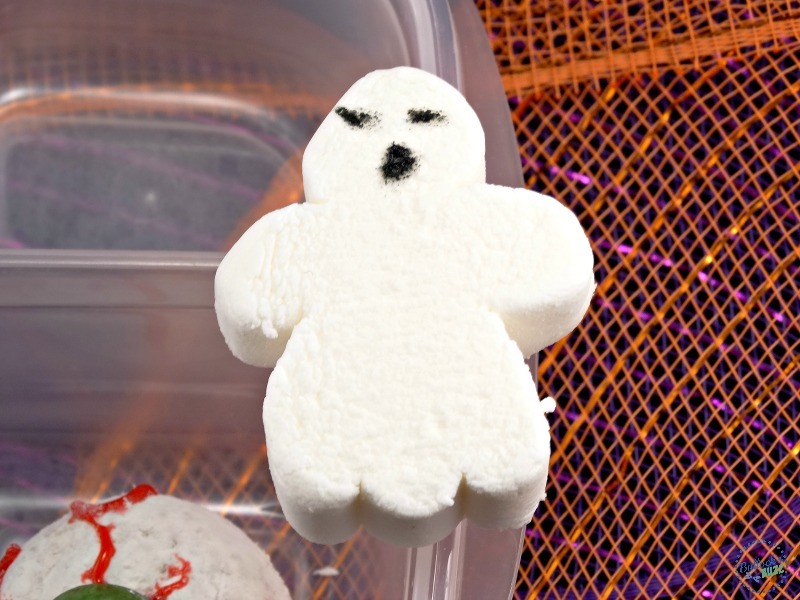 Use a black edible food marker to draw two eyes and a mouth on the ghost marshmallow. 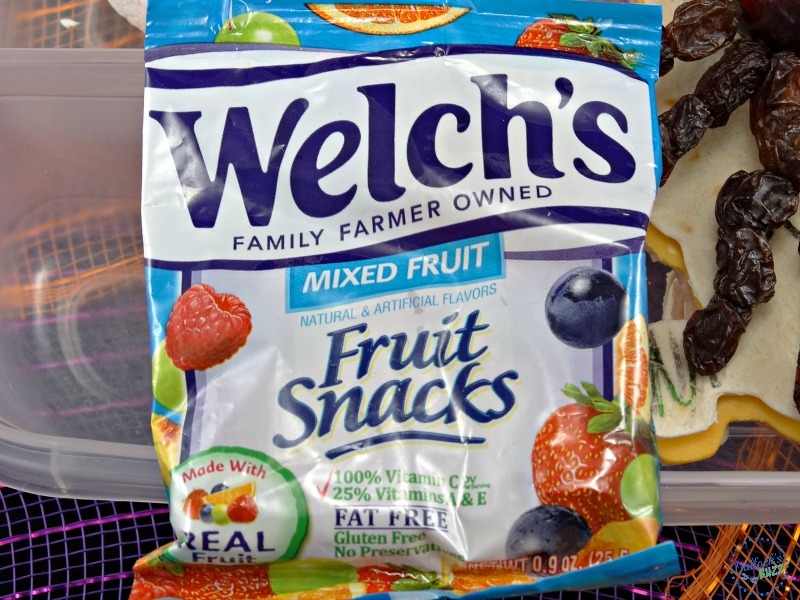 Grab a package of Welch’s Fruit Chews, and then place it all in a container. And that’s it. Your spooktacular Halloween themed lunch is finished! 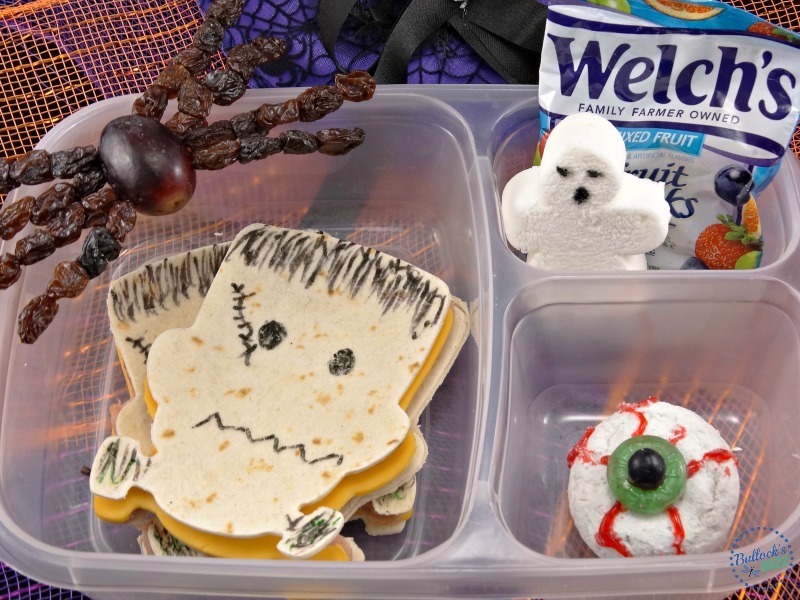 Add a Halloween-themed lunch note to make this lunch even more special. Speaking of children’s lunches, sadly, too many kids go hungry all day long. Thankfully, there is something you can do to help. 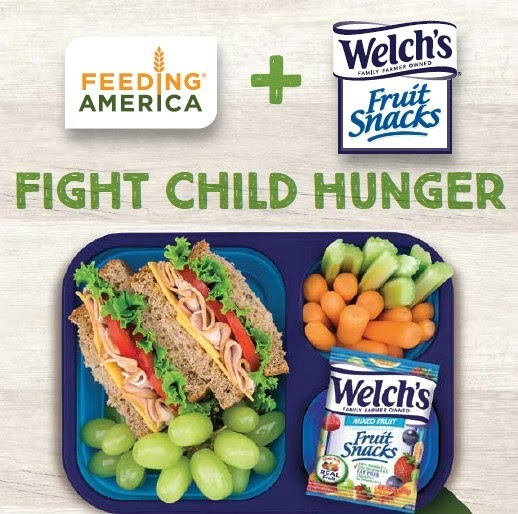 Through October, Welch’s® Fruit Snacks is partnering with Feeding America® the nation’s largest hunger-relief and food rescue organization to provide 1 million meals to children in need. 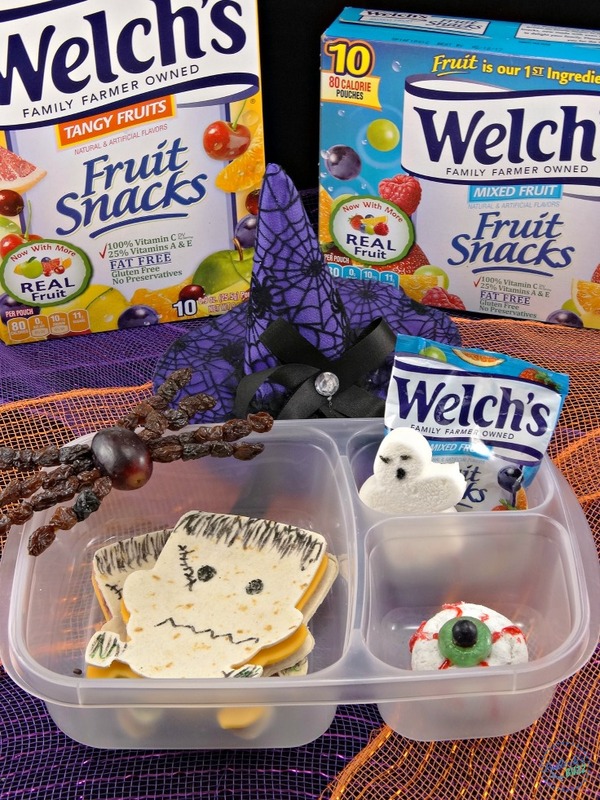 For each photo received, Welch’s® Fruit Snacks will donate $1.00 to Feeding America®! Do you have any ideas for a Halloween themed lunch? Share with us below!